Plastic. 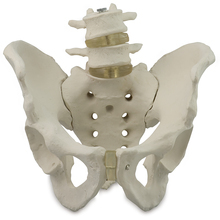 A complete, life-size replica of a human male pelvis consisting of the pelvic bones (ischium, ilium, and pubis), sacrum, coccyx, and symphysis. Plastic. A complete, life-size replica of a human male pelvis consisting of the pelvic bones (ischium, ilium, and pubis), sacrum, coccyx, and symphysis. Unmounted. Size, 30 x 20 x 20 cm.